Thucydides (c. 460/455 - 399/398 BCE) was an Athenian general who wrote the contemporary History of the Peloponnesian War between Athens and Sparta, which lasted from 431 BCE to 404 BCE. However, Thucydides' History was never finished, and as such, ends mid-sentence in the winter of 411 BCE. The History was divided into 13 separate books by later scholars, but is now, in its modern form, divided into eight books. Thucydides is quite often seen as the first historian to use 'modern' ideals with regards to his methodologies and ideologies, including the way that he uses eye witnesses as sources and cross-examines them, and the way that he uses speeches (a much-debated issue because of the problem of interpreting what Thucydides means when he describes how he goes about writing them, such as in (1.21) where it is not clear whether the speeches he quotes can be trusted as accurate accounts of what was said, or if they have been slightly fabricated by Thucydides to help with his themes). His work is meant as a “possession for all time” (1.22), rather than a piece designed to please the public (one of Thucydides’ many possible jabs at Herodotus and the other prose chroniclers of the day). However, Thucydides’ History was by no means the first history, which might be argued to have originated from Homer’s oral ‘history’ of the Hellenes’ heroic age. Still, a clear distinction to make is that whilst Homer was inspired by the Muses, Thucydides was inspired by his “histories”, his inquiries (our word for history comes from the same Greek word which means an inquiry). But again, Thucydides was not the first person to write down their findings as a 'history'; it was Thucydides’ near contemporary Herodotus who did that (on a grand scale, even though there were 'proto-historians' who wrote before him on a lesser scale). And whilst Herodotus was not inspired by the Muses (despite some of his passages feeling like they might have been), he still involves the gods and superstitions as motives and reasons for events. During Thucydides’ generalship, he was sent to Thrace to oppose the actions of the Spartan general Brasidas. There are two "Lives of Thucydides", both rather lacking in terms of actual biographical details (when compared to one of the many biographical works on Plutarch): the better, more detailed, account is a combination of biography and literary criticism, written by a 6th century CE grammarian called Marcellinus. From Marcellinus we know that Thucydides' father was called Olorus (a Thracian name) and also that he was perhaps related to Cimon, since Olorus was the name of Cimon’s grandfather, too. However, the reliability of these details is less than certain. During Thucydides’ generalship, he was sent to Thrace to oppose the actions of the Spartan general Brasidas. 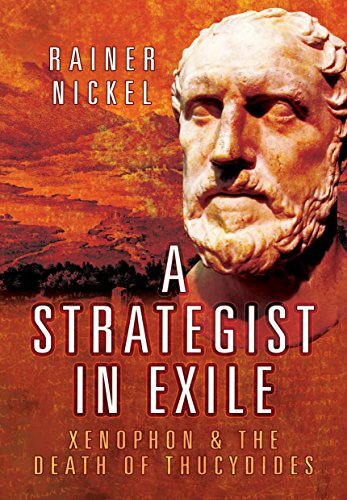 It was during this time that Thucydides failed to defend the city of Amphipolis, and as a result, was sent into exile by the Athenian people for 20 years. There is no real way to say for certain what happened to Thucydides after this, since he does not refer to his own actions per se after his failure at Amphipolis (which he recounts in the third person). However, it is reasonable to assume that this exile presented him with an excellent opportunity to gather accounts from both the Spartan and Athenian sides. Thucydides may have returned to Athens, around 404 BCE, with the fall of the Athenian Democracy and the imposition of the Thirty Tyrants in Athens by the victorious Spartans, but again, this is not certain. There are various elements of his History which are very worthy of note: Pericles' funeral oration (2.35-6), his description of the plague (2.47-54), the Mytilenian Debate (3.36-50), the Melian Dialogue (5.85-113), and the Sicilian Expedition (6 & 7) and his introductory sections, which include his Archaeologia and Methodologies (1.1-23). Maitland, J., "‘Marcellinus’’ Life of Thucydides: Criticism and Criteria in the Biographical," The Classical Quarterly 46/ 2/ 1996: 538-558. Lloyd, James. "Thucydides." Ancient History Encyclopedia. Last modified April 19, 2012. https://www.ancient.eu/Thucydides/. Lloyd, James. "Thucydides." Ancient History Encyclopedia. Ancient History Encyclopedia, 19 Apr 2012. Web. 20 Apr 2019. Written by James Lloyd, published on 19 April 2012 under the following license: Creative Commons: Attribution-NonCommercial-ShareAlike. This license lets others remix, tweak, and build upon this content non-commercially, as long as they credit the author and license their new creations under the identical terms. Please note that content linked from this page may have different licensing terms.